The California Work Opportunity and Responsibility to Kids (CalWORKs) program is a critical component of California’s safety net for families with low incomes. CalWORKs supports about 860,000 children throughout the state by providing families with modest monthly cash grants, while helping parents overcome barriers to employment and find work. Policymakers made a number of cuts to CalWORKs during and after the Great Recession, including reducing grant levels and eliminating the annual state cost-of-living adjustment (COLA). 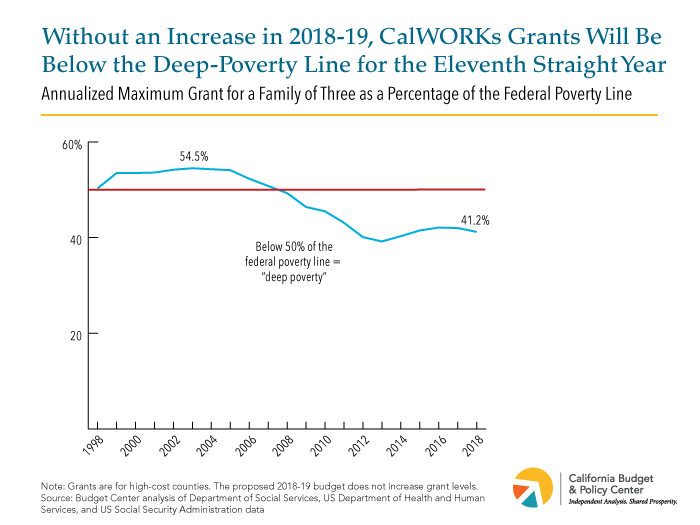 Recent years’ budgets have incrementally increased CalWORKs grant levels, but this has not been adequate to restore cuts made in prior years. The Governor’s proposed budget for 2018-19 — the fiscal year that begins this coming July 1 — does not increase CalWORKs grants or reinstate the COLA, despite the fact that state revenues are projected to exceed expenditures by billions of dollars. If grant levels remain frozen, the proposed maximum monthly grant for a family of three in a high cost county would be $9 lower than in 2007-08, without adjusting for inflation. If grant levels had been adjusted for inflation each year beginning in 2007-08, the maximum grant in 2018-19 would be $983, which is $269 higher than the proposed value of $714. 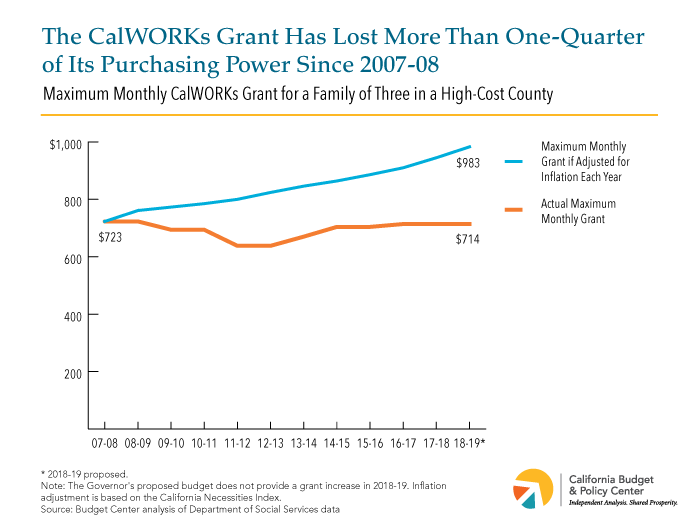 Because policymakers have not restored the value of CalWORKs grants, the purchasing power of the maximum grant will be 27% lower than in 2007-08. This severely reduces the resources that parents could use to provide food for their family, keep their homes warm, or avoid an eviction. For a decade following the implementation of welfare reform in 1998, the annualized maximum grant for a family of three hovered just above the deep-poverty line — defined as 50% of the federal poverty line. In 2008, however, the value of this grant dropped below the deep-poverty line. Absent a significant grant increase in the 2018-19 fiscal year, this grant will equal just 41.2% of the poverty line, leaving it below the deep-poverty line for the eleventh straight calendar year. Despite the state’s strong economic growth in recent years, the choices policymakers made during and after the Great Recession continue to hold back families participating in CalWORKs. Due to the fact that state revenues are projected to exceed expenditures by billions of dollars, the 2018-19 fiscal year offers state policymakers the opportunity to boost the economic security of very-low-income families with children. Policymakers should implement a multi-year plan for raising CalWORKs grants and restore the state COLA to ensure that this important program is better able to assist families in California.